Christos Gage continues the deep dive into the archives of MI-6's Ninja Programme as Colin investigates the Acclimation Bureau. 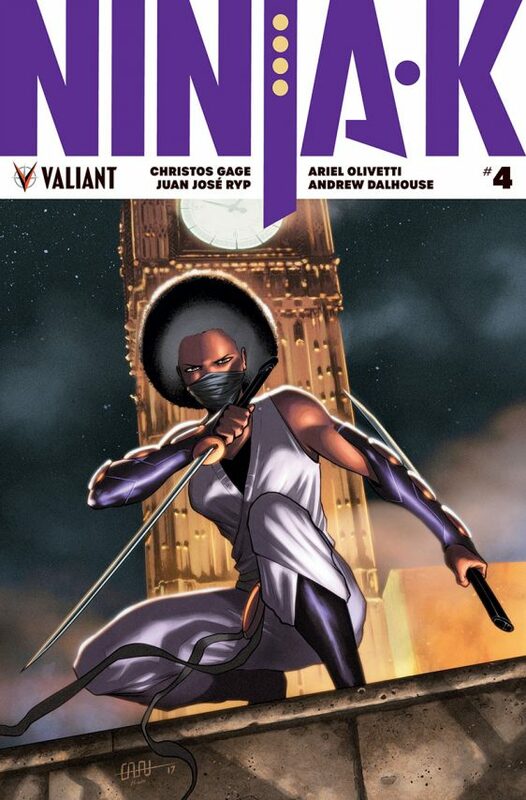 Issue four is all about Ninja-G, the "first woman, and first black ninja agent." Valiant has a great stable of characters and they're all fairly accessible. There's always new arcs and jumping off points to attract new readers making the publisher not only loyal to their creations but to the fans themselves. In 'Ninja-K' #4, it's really an origin story for Ninja-G, the MI6's top ninja agent during the 1970's but also a great introduction for new readers about how Ninja Programme works. For old readers, this story just adds layers of history to what they already know. It may be a standalone story in the service of a greater conspiracy but by the end, you'll demand a miniseries of G's exploits as soon as possible. What makes G's ninja origin unique when compared to others we've read about thus far is the fact that G's gender and race contribute to the nuances of her rise in the programme. Once an orphan, she was recruited into the MI6's "finishing school" where she learned various espionage skills but when it came time to hone seduction methods that's where she drew the line. Enter the Ninja Programme's sudden inclusivity change allowing women to participate in order to keep pace with the Soviets. This is where she excelled. The hand-to-hand combat, the stubborn refusal to submit, the sheer will to defeat her opponents ended up in broken bones for her classmates and the respect of her teacher. She persevered through the sexism and racism to become Ninja-G. It wasn't all rosy of course and what transpires is standard double cross spy stuff but so well executed it won't matter at all that you've seen this story before. There is such a zen appearance about G, her annoyance with Colin notwithstanding, that belies her younger intensity during her tenure as an agent. Yet, it doesn't look like she's lost a step. Her story does seem to corroborate what Ninja-C had told Colin and if manipulating the private lives of agents is the Bureau's mission then there was still hell to pay. Juan Jose Ryp does a great job with a neatly and fast-paced layout that's detailed and clean. The story is really told in the face of Ninja-G. The emotive range Ryp puts her through is extensive and right on the money. With Colin in his mask the entire time the story hinges on G's emotional roller coaster from flashbacks to the present. Andrew Dalhouse chooses a limited palette but mixes with brighter richer colors at times to give certain scenes an added punch. 'Ninja-K' introduces us to one of the Programme's most gifted ninjas and what I wouldn't give to see her in her heyday as MI6's first woman agent. Her origin story might sound familiar but Gage paints a picture of G as one of the deadliest and most formidable ninjas to ever face the Soviets and I want to see more. It's an excellent tease in a self-contained issue that's sprinkled with some bloody testicle rupturing action. You don't want to miss this issue.